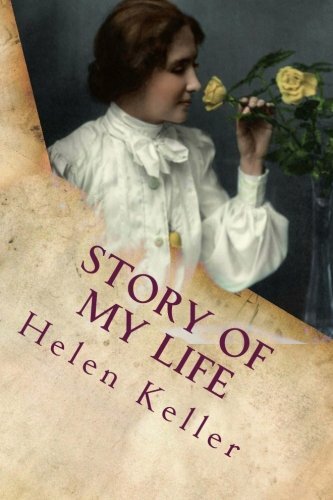 Amazon.com description: Product Description: Story of My Life, first published in 1903, is Helen Keller's autobiography detailing her early life, especially her experiences with Anne Sullivan. She was the first deafblind person to earn a bachelor of arts degree. The story of how Keller's teacher, Anne Sullivan, broke through the isolation imposed by a near complete lack of language, allowing the girl to blossom as she learned to communicate. THIS book is in three parts. The first two, Miss Keller's story and the extracts from her letters, form a complete account of her life as far as she can give it. Much of her education she cannot explain herself, and since a knowledge of that is necessary to an understanding of what she has written, it was thought best to supplement her autobiography with the reports and letters of her teacher, Miss Anne Mansfield Sullivan. The addition of a further account of Miss Keller's personality and achievements may be unnecessary; yet it will help to make clear some of the traits of her character and the nature of the work which she and her teacher have done. For the third part of the book the Editor is responsible, though all that is valid in it he owes to authentic records and to the advice of Miss Sullivan.